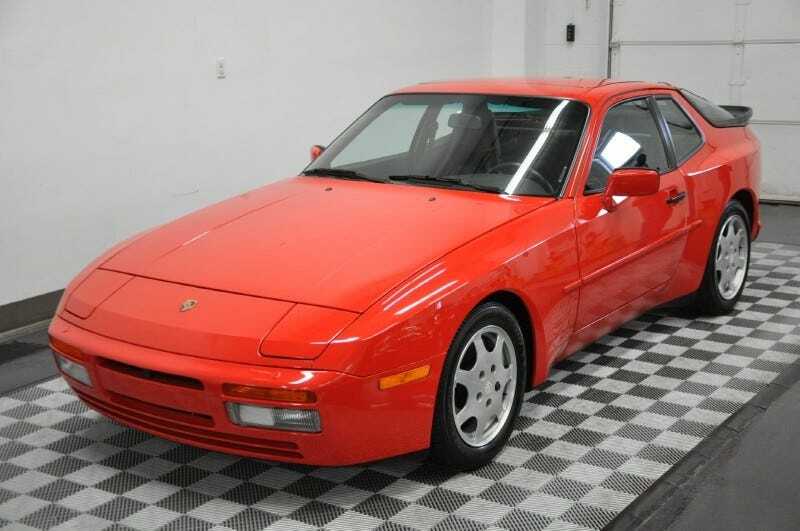 I just found what might possibly be the cleanest, lowest mileage 944 Turbo S ever. It even has what look like the original Goodyear Eagle ZR Gatorback tires on it. The want is strong, but there’s no price listed. So technically this isn’t a 944 Turbo S, because the 944 Turbo S was only sold in 1988. But for 1989, Porsche made all the Turbo S options standard on the Turbo. The seller kindly included a shot of the build sticker—it’s under the carpet in the hatch area—which shows the 030 and 220 option codes. These are the sport suspension and LSD. Let’s marvel at how super clean everything is on this car, shall we? Ridiculously low odometer reading along with silly Porsche “you have a turn signal blinking but I’m not telling you which one it is” light: present and accounted for. Practically spotless leather upholstery, with plastic on the carpeting, and awesome Blaupunkt tape deck and graphic equalizer: oh yeah. Engine bay you could serve a gourmet four course meal out of: yes indeedy. Pristine wheels with zero curb rash and period correct (possibly original?) Goodyear Eagle ZR Gatorback tires: indubitably. Last but not least, the original Porsche toolkit, air compressor (! ), booklets, and what looks like a front license plate bracket. I wonder how much they want for this car. Anyone want to call the dealer and find out? UPDATE: I called them to ask about the price.